PolarPrint is powered by Pharos Systems and requires the installation of Pharos software in order to print directly to from a personal computer. The Pharos installation package will download the appropriate version of the printer software based on the operating system type that you have installed (32-bit or 64-bit). This will also allow your computer to check in with PolarPrint and automatically download any updates or changes that have been made in order to make your printing experience better. IT can now make changes to print drivers, printer settings and more which will all filter down to your Windows-based computer with no changes required on your part. Follow the steps below to install your printer(s). From the list located here, find the printer to which you want to print. Click on the link and save the installer to your computer's desktop. 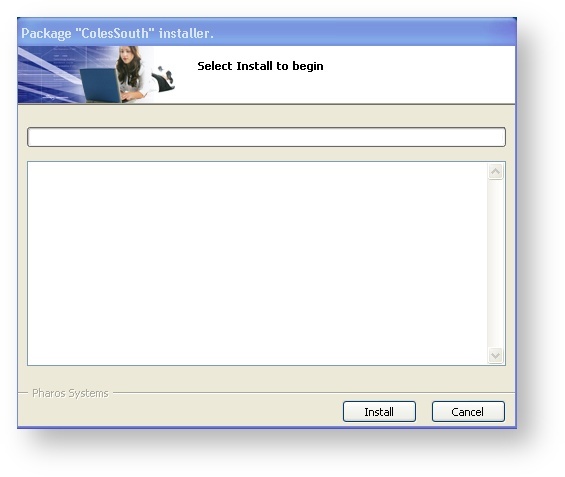 Double-click on the Installer on your desktop. If you are running Windows 7 through Windows 10 you will need to accept the dialog box asking if it is ok to run the application. When you send a print job to a PolarPrint printer the Pharos popup window will appear. Type in your Bowdoin username on the top line of the window and a name for your print job on the second line. This is how you will identify your print job when you got to the Print release station next to the printer. You must enter your Bowdoin username on the top line of the popup window. If you do not, you will not see your print job at any of the print release stations when you swipe your OneCard. Check out this knowledge base article I found in the Bowdoin College knowledge base. https://bowdoin.teamdynamix.com/TDClient/KB/ArticleDet?ID=22410 Install PolarPrint Printer for Windows Directions on installing PolarPrint Printers for Windows.